George's unpublished Handbook of Tonal Counterpoint, used for years with his university and private students, is now available for free online! Here you will find downloadable chapters and exercises, MIDI examples of all of the aural examples in the book, and even some amazing examples of music written in the polyphonic tradition. This is a wealth of countrapuntal knowledge that will take you from 1st species through writing your own 3-part fugues! A new digitally remastered CD of the 1986 Crystal recording which includes ENSEMBLES FOR BRASS QUINTET has just been released by Crystal Records. David Cran and Robert Suggs, Trumpet; Arthur Brooks, Horn; Wayne Wells, Trombone; Robert Posten, Bass Trombone; and guest artists John McDonough, Narrator; Heidi Lehwalder, Harp; and Elaine Bonazzi, Mezzo-Soprano perform works by Jerzy Sapieyevski, George Heussenstamm, Robert Starer, Douglas Allanbrook and Elam Sprenkle. played by Duo LiBra (The Netherlands). he is a member of ASCAP, is an honorary member of the international music fraternity, Sigma Alpha Iota, and is a former member of the American Society of University Composers (now called SCI) and the International Society for Contemporary Music. He was a member of NACUSA (National Association of Composers, USA), in which he served as Vice- President for many years. In 1976 and 1981 he was the recipient of Fellowship Grants from the National Endowment for the Arts. Eight of his compositions were recorded on LP and six of these have been committed to CD. From 1971 to 1984 he was Manager of the Coleman Chamber Music Association, the oldest continuing chamber music series in the country. Since 1976 Heussenstamm taught at Cal State Dominguez Hills, Cal State Los Angeles, Ambassador College, and steadily for 17 years at California State University, Northridge, prior to his retirement in June, 2000. Composer of more than 85 published works, he is the author of the book, The Norton Manual of Music Notation, released by W.W. Norton and Co. in March, 1987, and still a mainstay in the literature about the notation of music, making Heussenstamm one of the leading authorities in this field. He has also written a two-volume textbook on tonal harmony, Handbook of Harmony, which was the required harmony textbook at CSUN for several years. It has now been published in two volumes by Hal Leonard Corp. under the title, Hal Leonard Theory and Harmony and is available at book stores everywhere. His Handbook of Tonal Counterpoint, as yet unfinished, is written in a style geared for maximum comprehension by college-level students. Composing in a wide spectrum of media, George Heussenstamm's compositions have been performed with regularity both here and abroad. He is perhaps best known for his large-scale compositions for saxophone and brass ensembles. Among his non-academic activities are fishing, pocket billiards, going to concerts, and Scrabble. He was for 17 years the director of a Scrabble club in Glendale, California, and was chosen as Director of the Year in 1991 by the National Scrabble Association. He is an avid follower of national and international affairs, his primary source being BBC World Service over XM satellite radio. 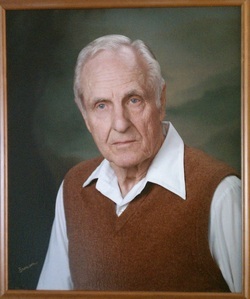 Married in 1957, his wife, Mary (1930-2005), was a locally well-known watercolor portraitist. Her book, Watercolor Portraits Painted on the Streets of Los Angeles, has been widely acclaimed.